A lone Italian gunman shot and wounded six African immigrants Saturday in a two-hour drive-by shooting spree, authorities said, terrorizing a small city in central Italy where a Nigerian man was arrested days earlier in a teenager’s gruesome killing. 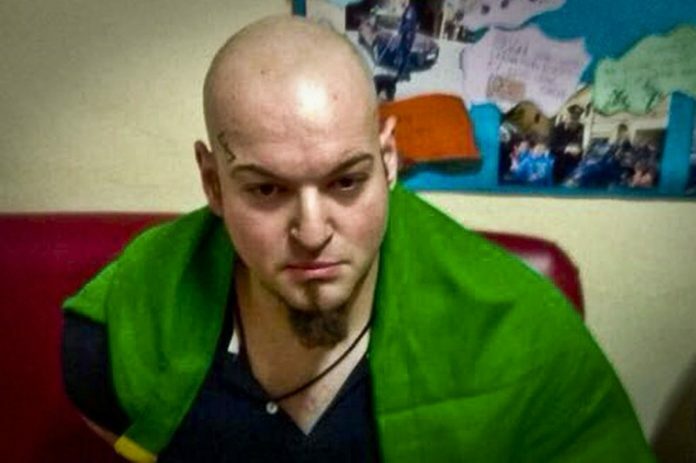 The shooting suspect with right-wing political ties had an Italian flag tied around his neck as he was arrested hours later in the city of Macerata. Authorities identified him as Luca Traini, a 28-year-old Italian with no previous record. Traini had run for town council on the anti-migrant Northern League’s ticket in a local election last year in Corridonia, the party confirmed, but its mayoral candidate lost the race. The news agency ANSA quoted friends of his as saying that Traini had previously been affiliated with Italian extremist parties like the neo-fascist Forza Nuova and CasaPound. As the violent attack unfolded in Macerata in Italy’s central Marche region, police told residents to stay inside and ordered a halt to public transport to limit the casualties. Such violent shootings are rare in Italy, and usually associated with the southern Italian mafia. A video posted by the il Resto di Carlino newspaper later showed the suspect with an Italian flag draped over his shoulders being arrested by armed Carabinieri officers in the city center, near where he apparently fled his car on foot. Italian news reports said a gun was found inside the car and the suspect did a Fascist salute as he was arrested, but no salute was visible in the video. The shooting spree came days after the slaying of 18-year-old Pamela Mastropietro and amid a heated electoral campaign in Italy where anti-foreigner sentiment has become a key theme. Italy has been struggling with large numbers of migrants coming across the Mediterranean Sea. Paramedics, background center, attend a wounded man after a shooting broke out in Macerata, Italy, Saturday, Feb. 3, 2018. 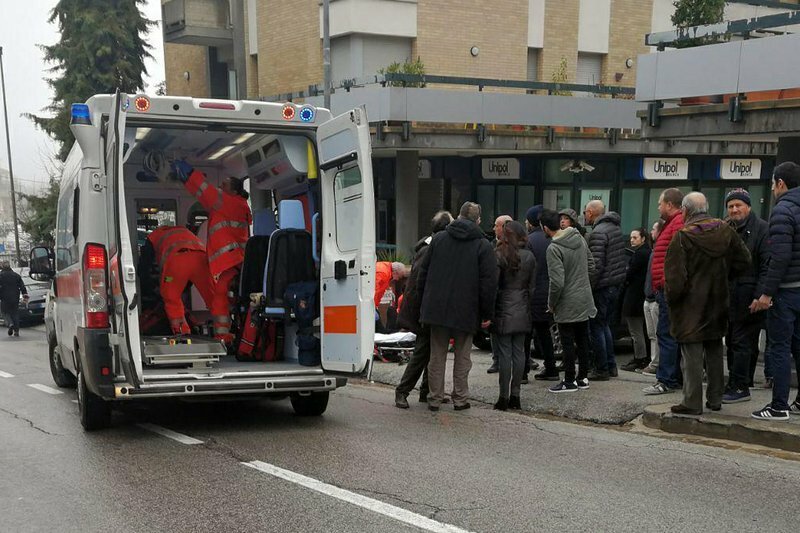 Macerata Mayor Romano Carancini confirmed that five foreign men and one woman, all black, were wounded in Saturday’s shooting spree, and one was left with life-threatening injuries. All were hospitalized. “They were all of color, this is obviously a grave fact. As was grave what happened to Pamela. The closeness of the two events makes you imagine there could be a connection,” Carancini said. Mastropietro’s dismembered remains were found Wednesday in two suitcases two days after she walked away from a drug rehab community. A judge on Saturday confirmed the arrest of the main suspect, identified as 29-year-old Innocent Oseghale. ANSA reported that the black car used in Saturday’s shooting spree had been seen in the area where the woman’s body was found and also near where the suspect lived. “We will stop this risk. We will stop it right away. We will stop it together,” Gentiloni declared. Italy is heading into a general election on March 4 and the head of the rebranded League party, Matteo Salvini, had capitalized on the teen’s killing in campaign appearances even before the shooting Saturday. He is pledging to deport 150,000 migrants in his first year in office if his party wins control of parliament and he is named premier. That has drawn sharp rebukes that Salvini is using the migrant crisis to foment xenophobia for political gain. Salvini’s League, which dropped the “northern” from its name in a bid for a national following, has joined a center-right coalition with Silvio Berlusconi’s Forza Italia and Giorgia Meloni’s much smaller Brothers of Italy. They are running against Matteo Renzi’s much-splintered center-left Democratic Party and the populist 5-Star Movement. Salvini told reporters Saturday at a campaign stop in Bologna that he would bring security to Italy. “Whoever shoots is a delinquent, no matter the skin color. It is clear that out-of-control immigration … brings social conflict,” he said. Senate president Pietro Grasso, who is fielding a small liberal party called “Free and Equal,” chastised Salvini for using a tragedy for electoral gain. “Whoever, like Salvini, exploits news events and tragedies for electoral purposes is among those responsible for the spiral of hatred and violence that we must stop as soon as possible,” Grasso said.